I was born into a vigorously oral society, a world of griots. The spoken word was basic for communicating experience. I fondly remember living in an atmosphere of charged lyricism, riveting anecdotes, startling wisecracks, needling jests, pithy proverbs, witty riddles, intriguing word play, nuanced conversations, stirring songs, and melodic chants, all of which continue to haunt my imagination. Every day was a learning experience in the power of the spoken word. Early Christian missionaries invoked these oral cadences to bridge the barriers of language and culture. They appealed to the oral resonances in our tradition to win the hearts and minds of those they proselyted. To get their gospel message to stay in the heads of their non-literate audiences, they worked their way through such aural and auditory elements like arresting stories and catchy songs. Knowing parables have folksy structures that echo our oral narratives, they cashed in on these too. Apart from the familiar storytelling devices honed in them, parables carried over with other staggering appeals well loved by the people. Like our folktales, the parable was not only aesthetically satisfying but also morally instructive. The master teacher, Jesus Christ, used parables to dazzling effect. With its surface and underlying meanings, he used parables to connect with audiences who sought entertainment and those who sought knowledge. In addition, the setting of the Lord’s society in some ways resembled mine where withering illiteracy compelled rustics to rely on oral traditions to preserve and pass on knowledge. In my childhood, this heritage was a lively incentive to memory. Songs and stories easily enabled my people to connect with the light and truth they were taught. The long-lasting effects of these on the minds of the people burned in them a desire to know more. The missionaries keyed on to this interest by introducing literacy programs. If the people could read and write they could enjoy and live Bible principles when the missionaries were recalled or went proselyting inland. My maternal grandfather, Jacob Iwok, was so smitten with these stories upon converting to Christianity that he bought a Bible even though he could not read. Flush with love for learning even at old age, he got his only son, Monday Jacob, out to school, picked up a few alphabets himself and recorded events on the blank pages in the book. Although he died before I met him, I was thrilled by what he scrawled and highlighted as his favorite scriptures. These inscriptions transported me back in time so that I could see him groping for truth and forging a future for his posterity. Mother often told us he would sit on a wooden recliner, giving thought and attention to the Bible he held. He loved Psalms, Proverbs, and the story of Job. He had lost and grieved over relatives, so Job’s assurance that if he died he would see the Lord again in the flesh had especial appeal to him. He pondered the virgin birth and the empty tomb but knew God was all powerful enough to do the impossible. Jesters were quick to vilify him for holding a book he could not read. “Jacob,” they taunted, “isn’t that thing supposed to be read with the eyes by those who know how? It seems you’re reading it with your nose,” they mocked. Cheerfully he would tell them that, “Edisana Spirit,” meaning the Holy Ghost, was his teacher. 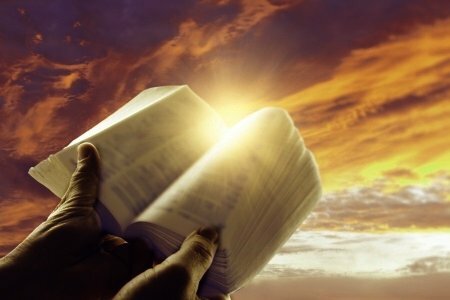 Lifting the Bible up, he would add that somewhere in that book was a promise that the Holy Ghost would teach him the truth of all things. When he spoke like that, those who were not converted to his faith jeered. It maddened them that he, the son of a chief and a chief himself, abandoned the religion of his ancestors for Christianity, so they scowled and barked. Yet others feared his Bible was a powerful juju which prevented him from the curses they placed on him for choosing the new religion. Those who scorned him for giving up his status to pursue the new religion hardly knew his preference conferred on him greater relevance. Among the scoffers were folks who had court business to do in a nearby small town. At court instead of the charms they swore at back home, they were asked to place their hand on the Bible and swear they would tell the truth and nothing but the truth. If anyone needed proof the Bible was voodoo, that was it. Grandfather was unperturbed. Rather he made a shelf in his living room for his Bible and his Church Hymnal. Since they had no idea what a library was, folks concluded the shelf was a shrine and the sacred books it held had magical powers. The old man desired his scriptures be placed in his coffin. Before the coffin was sealed, however, Mother, infected by her father’s love for the Bible, reached out and stole it when no one paid attention. She sneaked out and hid it so that not even her mother could see it. For a long time, she retained and handled that Bible with care like a curator with a delicate artifact. As I gently flipped through the fraying book one day under her watchful eyes, something caught my attention. In laborious handwriting Grandfather wrote the names of his family members, apparently consecrating them to the Lord. His desire was so electrifying I felt a powerful connection to him. That meager writing, probably the only one he knew how to write keenly, turned my heart to him and challenged me to live his love for God, family, and learning. Of all the treasures Mother lost during our civil war, the loss of that Bible remains the most painfully haunting.